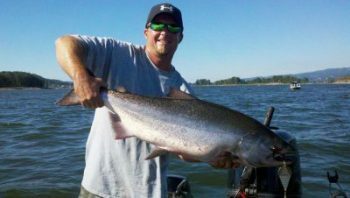 Fish Hunters Guide Service founder, Travis Choquette offers trips to the best fishing spots on the Columbia River. Each trip is customized based on your preference and which fish are in season. Your trip will be meticulously planned weeks beforehand to ensure you get the experience you’re looking for. We will also offer suggestions for prime fishing near Vancouver, and if there is a fishery or technique you prefer, we will gladly make accommodations. Whether you’re a long-time resident, or just visiting, hiring a fishing guide in Vancouver is the best way to plan your next fishing trip. The city sits right on the Columbia river, offering prime access to fisheries between Buoy 10 in Astoria and Bonneville Dam. The Columbia River offers passage for massive populations of salmon and steelhead every year. In fact, some of the largest populations in the world travel from as far away as Idaho to the Pacific, providing consistent opportunities for sport fishermen in the area. Once you book your trip, Travis begins the process of checking past trip reports and hatchery release schedules, considering techniques, studying runs, and rigging lures. He then prepares bait by hand using special, time-tested recipes. Finally, he customizes tackle, and rod/reel combinations to suit the trip. What Happens on a Guided Fishing Adventure? As for preparation at home, just make sure to pack a light lunch, sun protection, and depending on the weather, basic wind and rain gear. You’ll be on the water, after all, and temperature conditions tend to change quickly. And though this will be an unforgettable experience for you, bring a camera for posterity! A 23-foot sled boat will take you from the dock to the best spots along the Columbia. Along the way, you can chat with Travis about salmon and chinook fishing in the area and ask him about his extensive experience. While you’re caught up in conversation, don’t forget to take in the views — some of the most spectacular scenery in the country is found along this route. Contact us for amazing guided fishing in Vancouver, Washington!